MONDAY, May 12, 2014 (HealthDay News) -- A new study of French power company retirees finds that those who were exposed to solvents and benzene on the job -- even decades earlier -- were more likely to score poorly on memory and thinking tests. The findings don't directly confirm that the chemicals harmed the mental powers of the former workers, and it was not clear if those with more thinking problems face more issues getting through their day-to-day lives. But the research does point to potential harm from the chemicals, said study lead author Erika Sabbath, a research fellow with the Harvard School of Public Health. "The people who have been highly exposed tend to perform worse or be slower on certain cognitive tasks than unexposed people," she noted. Solvents are used to dissolve other substances. According to the U.S. Centers for Disease Control and Prevention, they're used in the manufacture of products that range from paints and glues to clothes, plastics, pharmaceuticals and more. Some, like benzene, are thought to cause cancer. In the brain, "solvents are absorbed by tissues and cause impairment in cognitive tasks like working memory and processing speed," Sabbath said. For the new study, which was published May 13 in the journal Neurology, the researchers tracked 2,143 retirees from the French national utility company Electricite de France-Gaz de France. The participants, whose average age was 66, took part in eight tests of their memory and thinking powers in 2010, about 10 years after they had retired. Thirty-three percent had been exposed to chlorinated solvents on the job, 26 percent to benzene and 25 percent to petroleum solvents. Those who'd been exposed to the highest levels of solvents had an 18-54 percent higher risk of scoring poorly on the thinking tests compared to those who hadn't been exposed, the researchers found. The tests, Sabbath said, measured things like switching tasks, making connections and "mental processing." Those who were exposed to the chemicals most recently scored more poorly on a variety of areas measured by the tests, Sabbath added, noting the finding was a new discovery in this area of research. But, she also noted, "in people who'd had a lot of exposure 30-50 years before the testing but not since then, the effects stayed. They didn't fade away." It's possible that the chemicals had nothing or little to do with the differences in thinking powers between the workers in the studies. However, the researchers report that the differences persisted even after they adjusted for such factors as education levels. Dr. Daniel Teitelbaum, adjunct professor of occupational and environmental health at the University of Colorado School of Public Health, said the study findings fit with decades of research into the risks that workers exposed to these chemicals will develop thinking problems. The hazards "have been obvious to people who do occupational medicine toxicology, but vigorously fought by industry," he said. The higher rate of thinking problems matters, he added, because it gives people a mental handicap going into old age when they're already prone to declines in thinking. What to do? 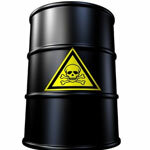 Sabbath said the chemicals are common in American workplaces, appearing in 12-13 percent of them. "Given that things like dementia and Alzheimer's disease are on the rise and there's no known cure, it's important that we prevent cognitive problems," she said. "Wear a respirator if you're working with one of these chemicals, or use safer versions of paint or paint thinner." Better regulations are the best ways to prevent problems, she added, but the current "maximum permissible exposure level may be too high to completely protect workers. This puts the onus on employers to protect their workers either by eliminating the exposure altogether or, if they can't eliminate it, by providing adequate protective equipment to their workers and enforcing its use."